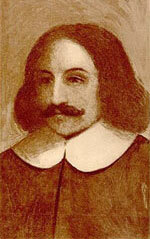 William Bradford, the second governor of Plymouth colony elected to fill the place of the deceased John Carver, was responsible for the infant colony's success through great hardships. The Pilgrims were part of a strain of Puritanism known as Separatism, which denoted the aim to completely secede from the Church of England. The Pilgrims held to a Congregational rather than a Presbyterian form of church government. Not all of the Plymouth colony were Christians, however, and some spoke of using their liberty in defiance of the Pilgrims. Unless they could be held together in unity there was little hope they would survive. The success of the Plymouth was based on covenantalism - the belief that men could form compacts or covenants in the sight of God as a basis for government without the consent of a higher authority. The church of the Pilgrims was already bound by a strict mutual covenant. But to include those outside of the church, a civil compact was drawn up - the constitution and foundation of a Christian democratic republic in the New World. The Mayflower Compact acknowledged the right of everyone who signed it to share in the making and administering of laws and the right of the majority to rule. It was the constitution of a pure democracy, the principle of Congregational church government applied to the state. This was all the law they had for several years. It worked because they chose Christians as their leaders and all understood that they were to be self-governing under the moral law of God.